Pete Tomasi's Green Lantern Corps is the G.L title. Heck I even named it the best book of 09. Now with DC announcing Peter's about to step off to launch a new Guy Gardner focussed series; Green Lantern: Emerald Warriors, GLC fans like myself, couldn't be blamed for feeling a little anxious as to who is about to take-over the hit title. Wait... it's Tony Bedard? The writer who blasted the 64th tier cosmic characters in R.E.B.E.L.S out of the park monthly? Oh... crisis averted. This is a brilliant choice by DC and one that's well deserved by Bedard, who really has done the hard yards for R.E.B.E.L.S, including setting up a Facebook page to support the title. 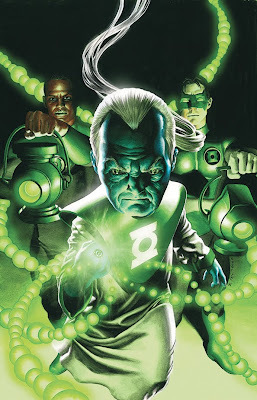 The cover of Tony's first issue, shows Guys departure brings John Stewart and Kyle Rayner to the fore, along with 'Green Lantern Ganthet'. Hopefully the little blue dude can pull a double shift, and still lead the Blue Lantern Corps, as they are some of my favourite new additions to 'comics'. Plus, after so many years of 'grim and gritty' a little more hope is never a bad thing.